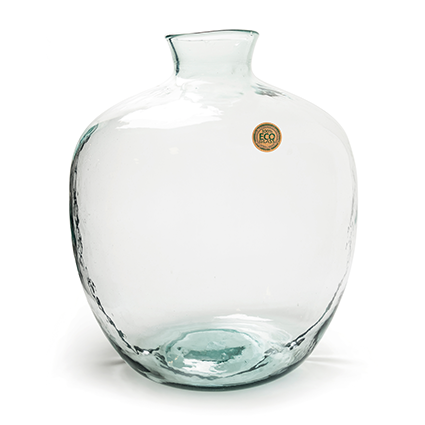 For centuries vases were made of clay, wood, metal, plastic and glass. And still the manufacturing of glass has hardly changed for centuries. The legend? The ingredients have hardly changed; sand and soda are still the main ingredients. But it can be greener! The great thing about glass is that it can be melted again after use. But how do you get now 'Eco glass'? Many people will recognize, on a Saturday to the grocery store, but first we throw the empty glass jars and wine bottles in the bottle bank. Our Eco glass is made of these jars and bottles. All 'junk' (e.g. lids, corks and caps) is removed and then the glass will be melted in the oven. An additional advantage of Eco glass is that it melts at a much lower temperature. There is far less energy required for the production of Eco glass. Of course the Eco glass won’t be ‘crystal clear‘, there are often little irregularities in the glass. This is because there always is a little bit of pollution in the recycled glass, but ‘ this features the artisan quality of mouth-blown Eco glass ‘. So beautiful and functional and still green! Of course, we try to contribute to a better world. So we press all our cardboard and seal foil to bales so that they can be recycled. Our office, showroom and our warehouse are lit with LED lighting. Would you like to see our current Eco glass collection?